A&D Weighing recently solved a problem for an Australian strawberry grower based in WA, with customised, NMI trade approved bench scales that significantly improved the efficiency of their packing processes. This strawberry grower supplies hundreds of tonnes of berries to retail supermarkets each year and is renowned for their premium strawberries, so they expected a premium solution. Improve packing process for packing staff of 30+. Need to accurately weigh out 250g punnets accurately and quickly. Need NMI trade approved scales to meet Australian and Retail legislative requirements. 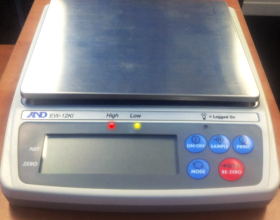 Robust portable bench scales with easily readable displays and comparator functionality. The A&D Weighing design team went to work to enhance the standard A&D EW-i bench scales with custom modifications to support the most efficient packing process possible. The scales were assembled, tested, inspected and delivered within budget and time-frame. Now the packing operators simply turn on their scales and with the aid of the bright comparator lights prompting the packers to when the target punnet weight is met/over/under, they fill their punnets. The punnets are then boxed and ready to be delivered. 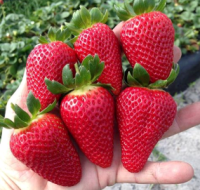 Next step – super sweet, fresh strawberries at your local supermarket! More efficient & intelligent weighing process, releasing extra labour for other tasks. Added peace of mind that scales are trade approved by NMI Weights & Measures to align with QA processes. Identifies trends & errors in real-time to reduce unnecessary giveaway and wastes. Improved batch QA & QC – system can further be expanded to allow full data capture & reporting. Locally designed solution, easily supported by their local scale service provider. A&D Weighing also ensured a “future-proof” system by utilising scales that would easily allow the client to add wireless scale weight communication directly to their production PC if ever required. Most A&D scales, balances and weight indicators can be expanded in this way. This is another example of A&D Australasia continuing to prove that economical, Australian designed and supported solutions are a vital resource for local industry and are proud to continue to work with this WA strawberry grower to produce quality prime fruit & berries now and into the future.